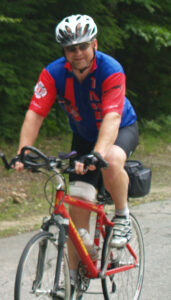 Greg hails from Peninsula, OH, a small town south of Cleveland and 700 miles from the Trans NH starting line. 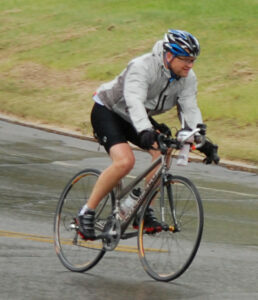 Greg first rode the TNHBR in 2006 and has participated in 7 of our rides. 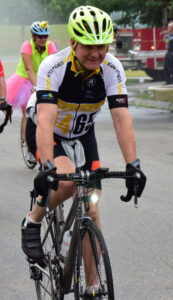 In 2018 Greg cycled from OH to NH to participate and then rode home as well. Greg asked that we not make this profile about him but to use it to bring attention to an issue near and dear to his heart – how he, and other cyclists, can ride smarter. This issue arose because Greg saw two of his friend’s be killed by a motorist who made an illegal left hand turn while texting and who admitted to drinking before driving. This driver was not convicted because the jury said that the cyclists deserved what happened because cyclists never abide by the rules of the road. As you can imagine this verdict has haunted Greg so he wants to make a difference in honor of his friends by bring forward the awareness to cyclists that we must obey all traffic laws to be accorded the respect we deserve from motorists. A cyclist is at a stop light doing a track stand – how does the motorist know if the cyclist is intending to go or intending to stop…. Greg has come up with a mantra that he will use and that he wants all fellow cyclists to use that will send the message to motorists that we’re abiding by the law to help us get the respect we deserve on the road and in the courts. STOP then GO, HEEL then TOE. If you come to an intersection make sure you come to a complete stop by putting one foot completely on the ground making sure your heel comes in contact with the pavement. Once you’ve stopped and the light has changed (where applicable), you can push off your toe then go. It’s simple and it’s a way to send the right message to the motorists we encounter and it might just save your life.